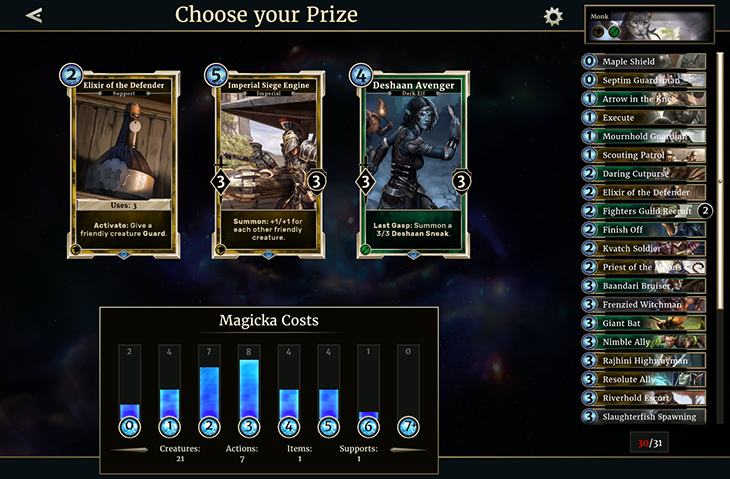 Once you’ve spent a little time building decks and learning your strengths in The Elder Scrolls: Legends, you might be ready for a new type of challenge. Taking everything you’ve learned from the Story and Battle matches, step into the Arena and test your skills with a deck built completely on-the-fly against a gauntlet of widely different opponents. Are you ready to test your luck in the Arena? An Arena run costs 150 gold or 1 Arena ticket. Depending on how well you perform, you could win this back and much more during your time in the Arena. Before you can take on an opponent (either another player or the AI), you’ll need to craft an entirely new deck that you’ll use only in your specific Arena visit. After you select your deck class (which you can learn more about here), you’ll be presented with a series of 30 draft picks. Choose one of three cards presented to you until you have 30 cards in your new deck. 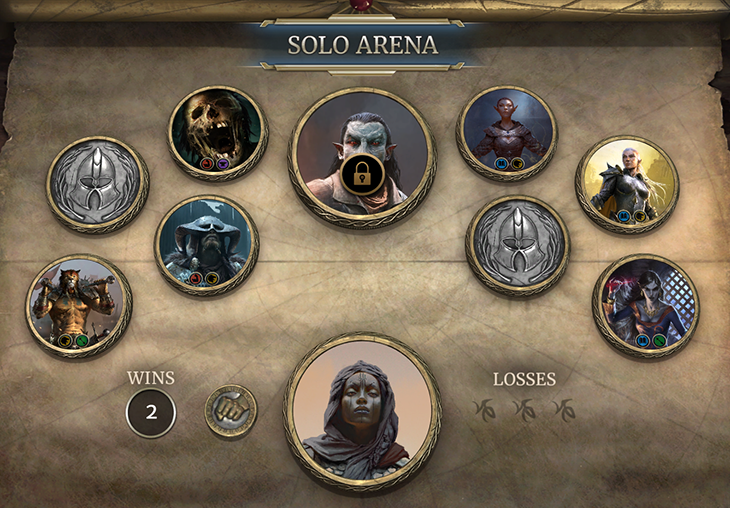 In Solo Arena you’ll play against eight AI opponents and one boss, and in Versus Arena you’ll face up to nine other players. When you suffer three losses, your time in the Arena comes to an end. When you start an Arena run, you’ll first need to pick one of three classes provided at random. (Remember: A class is a combination of two attributes.) This choice will determine which cards you see during the Arena draft. For example, the game might give you the Assassin, the Crusader and the Monk classes to choose from. If you take the Assassin, you’ll only see Agility (Green) cards and Intelligence (Blue) cards during your draft (and of course neutral cards). 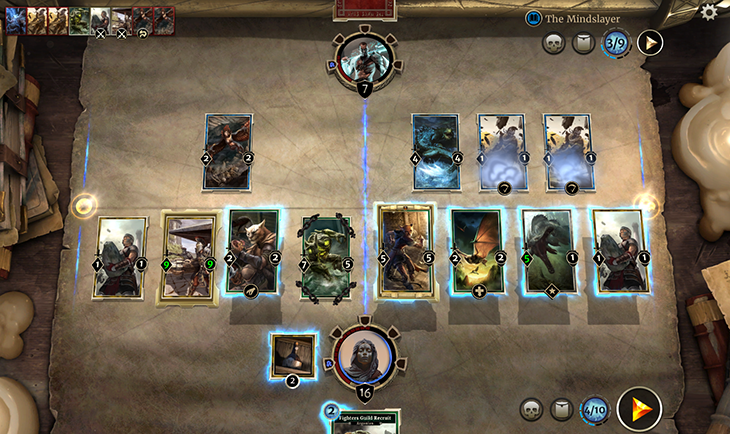 In our Introduction to Deck Building article, we suggested being mindful of your magicka curve. Well, the same is true here. Keep an eye on your deck on the right-hand side of the screen, because you won’t be able to swap out cards once you’ve chosen them. You don’t want too many zero and one cost cards, and you don’t want too many six and seven (or above) cost cards. Some of them are great and will give you a lot of power in the late game, but you may want to round out your mid-range for best results. The right column where your deck is located is also convenient for cards like Cunning Ally, which lets you draw a Firebolt if the top card of your deck is an Intelligence card. With your deck visible as you’re drafting, you can always determine how likely (or unlikely) it will be for abilities like this to trigger. Once your deck is built, it’s time to play your matches. 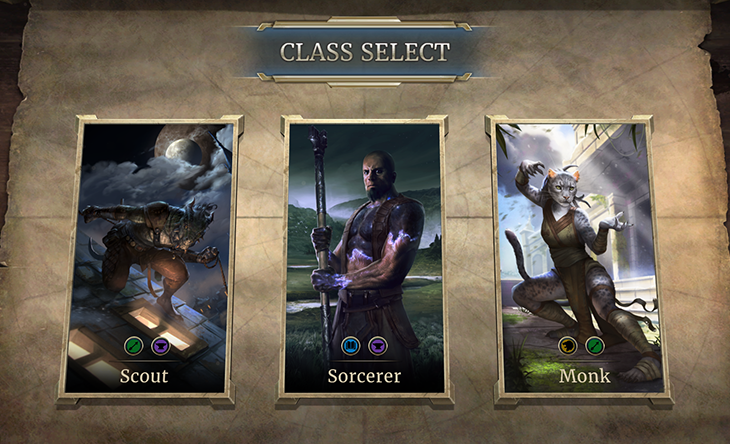 If you’re playing Solo Arena, you’ll have the option to face one of eight different computer opponents, each of a different class. Some of these opponents will also have special modifiers that may affect your matches. Get past all eight of these, and you will fight the boss of your particular Arena. At the end of the Arena (and after each match you win), you will earn prizes based on how well you do, or how many match wins you accumulate out of the nine possible battles. You can only lose three times before your Arena concludes, and you must beat all eight of the standard opponents before you can take on the boss. If you lose a match, you’ll need to battle that opponent again until you win in order to proceed. Each time you defeat an enemy, you get the added bonus of being able to draft an additional card for your deck from three new card options. Additionally, Arena matches will also count toward your daily quest goals. It’s worth noting that you don’t get to keep the cards you draft in the Arena. All is not lost though! After each win in the Arena, you’re awarded prizes (just like in the Story mode) that can range from gold, to new cards, to card upgrades and even extra quests. And these you do get to keep. Forever! Well, except for the quests. Those disappear when you complete them. The Arena guarantees a new and unique experience each and every time you play. While it can be a little intimidating at first, don’t be afraid to dive right in. We’ll get deeper into deck building strategies in a future post, which should further help you in your Arena drafts.